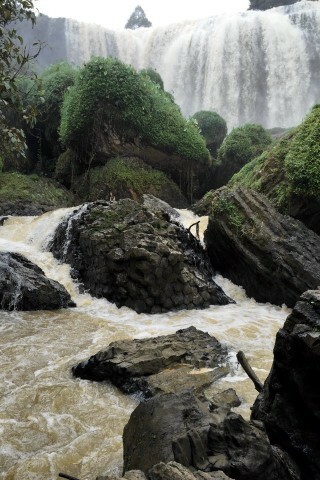 The Elephant Waterfalls or Thac Voi is a waterfall located at Nam Ban village, 28 kilometres from Da Lat’s city centre. Browse places to stay in Da Lat on Booking.com. Book Now - Pay Only When You Stay. It is an impressive sight, especially since you can stand quite close to the cascade, and it is a stop on most Da Lat motorcycle/Easy Rider day tours. It only takes 10 minutes to reach the bottom of the falls but the way down is tricky. The first half is on bricked stairs with metal handrails, then it is on uneven trail that can be extremely slippery and muddy. Steady feet and decent hiking sandals/shoes are required. Getting a good view/snapshot of the cascade involves perching on an uneven bolder with strong water rushing past. Admission is 10,000 VND, and unfortunately none of that money seems to go to rubbish collection as the pathways are strewn with unsightly garbage. If you’re not in a rush and want to save money, you can take the green local “Da Lat - Phu Son” bus to Nam Ban village. It departs from the bus stand at the top of the central market (at the south end of Nguyen Van Troi next to Eximbank), every 35 minutes from 06:00-17:20, takes 45 minutes and costs 20,000 VND one-way. Show the fare collector “Thac Voi” and you will be dropped off at the junction where you can make your own way to the falls. You can easily combine the falls with a visit to the Cuong Hoan Silk Centre to see how silk is made. It’s just 400 metres up the road on Dien Bien Phu/DT 725 and is well-marked with a sign. See below for more sights and activities in Da Lat that are listed on Travelfish.org.